Long-lasting treatments, or treatments of teeth that are difficult to access, can be stressful for the patient. Our anaesthetist, Dr. Hechler, will literally help you sleep through this unpleasant time. In many cases, nitrous oxide sedation or dental hypnosis, for which some of our doctors have special training, is also sufficient. In a detailed discussion, Dr. Hechler will inform herself about your state of health and discuss the possible procedures with you: Shorter procedures of up to one hour can be performed in twilight sleep (analgosedation): Medicines are administered to create a pleasant relaxation. Patients remain responsive, but only remotely or no longer perceive the events around them. Heart, circulation and oxygen supply are controlled over the entire period. Classic general anesthesia is recommended for prolonged dental treatments. Here too, anaesthetics are used, which are administered intravenously. The patients fall asleep relaxed and feel absolutely nothing for the duration of the operation. Heart, circulation and respiration are constantly monitored. With modern anaesthetics and their administration adapted exactly to the patient’s needs, patients wake up quickly at the end of treatment and can go home accompanied for a while. No procedure is without risk, but by constantly monitoring the patient on the monitor, allergic reactions to medication, for example, can be quickly detected and treated. 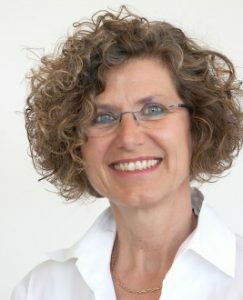 With her many years of experience, Dr. Hechler offers you a high degree of security you can trust. You can drink clear liquid up to 2 hours before arriving in the practice. Please let us pick you up. Don’t stay alone overnight either. Drink small amounts if the dentist allows it. If you tolerate this well, you can also have a light meal. 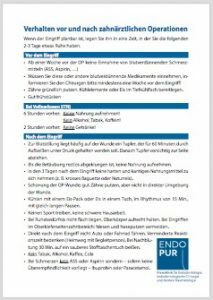 In our leaflet (PDF) you will find the most important tips for a smooth dental operation. Relaxed – at the dentist?! Even if nobody likes to admit it – nervousness and fear before or during a visit to the dentist are not uncommon. More than 70% of the population experience them. It’s only natural to ask for help. Can you feel comfortable at the dentist? The practice at Kureck says: of course! 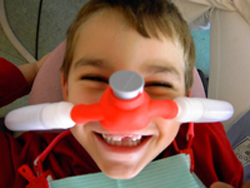 Laughing gas, for example, is a pleasant sedative that works quickly and is also well tolerated by children. Laughing gas immediately relaxes and reduces the sensation of pain. One feels an inner calm and feels a little like in a dream. The treatment time seems to pass more quickly, and yet one remains awake and responsive. Only 5-10 minutes later you are completely clear again and can go home. The method has been used by dentists for decades and is constantly improved technically. A small nasal mask is used to inhale a mixture of pure oxygen and nitrous oxide. The dentist increases the dose slowly until the patient is relaxed and free of anxiety. The practice at Kureck offers its patients nitrous oxide sedimentation at the latest technical level. Talk to us! We will be happy to advise you. Valerian not only for the ears. You are welcome to let your thoughts fly away from the treatment while listening to relaxing music. You will receive a CD player with a special trance facilitating music program. Dr. Henning Bahnemann and ZA Christof Riffel were trained in the method of dental hypnosis at the Milton-Erickson-Institute in Hamburg and have many years of experience in this field. In hypnosis sleep you calm down so much that the treatment does not stress and hardly or not at all hurts.